If you would like to purchase any of these images as prints, clicking on the Buy Photo button above the image will allow you to choose between a range of finishes including canvas, aluminium or traditional photographic paper, all available in a variety of sizes. If you have any problems or questions, drop me a line by clicking on Contact at the top of the page. 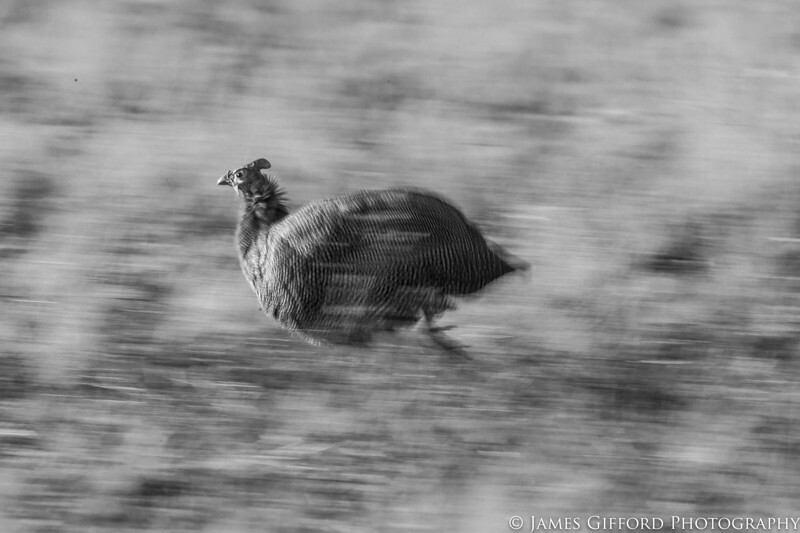 I have spent a long time trying to capture a successful panning shot of a helmeted guineafowl. Their propensity to change speed and direction without warning, together with a tendency to constantly move their heads have lead to numerous failed attempts. On this occasion in SAvute, Botswana, one of the flock seemed particularly aggressive, chasing its colleagues for no apprent reason. Luckily one of them raced right by me at pace, creating the opportunity I had been waiting for.